Lindsay Phillips is the energetic inspiration and founding force behind SwitchFlops. Her footwear concept evolved from a high school art projectâ€”ceramic flip flops (pictured). Amazed by the response, Lindsay began designing functional flops with colorful straps, each adorned by a unique button. Her idea evolved when she realized that by using Velcro she could create one shoe with many strapsâ€“unlimited choices with minimal effort. 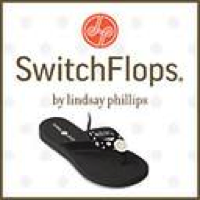 This simple, yet brilliant innovation was the birth of SwitchFlops.